Welcome to November’s Women to Read. I got a little enthusiastic this month, so I have five recommendations this time around. However, November is the perfect time to hunker down under a pile of blankets with a hot beverage and a good read, so here we go! 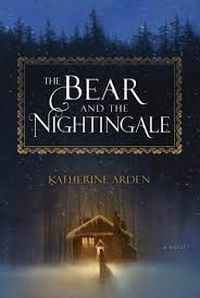 My recommended starting place for Katherine Arden‘s work happens to be her debut novel, The Bear and the Nightingale, which weaves together myth and history in medieval Rus’. Pyotr Vladimirovich’s wife Marina dies giving birth to their daughter Vasilisa. As Vasya grows, raised by Pyotr, the nurse Dunya, and her older brothers and sister, she proves to be a strange child. She runs wild, talks to household spirits no one else can see, shows an affinity for horses, and many believe she is a witch. Even so, her family and her nurse love her fiercely, and she loves them. As time passes as Vasya grows, Pytor reluctantly decides it’s time to take a new wife. Like Vasilisa, Anna sees spirits everywhere, however unlike Vasya, she believes they are demons and thus hates her new home, and comes to hate Vasya as well, believing her to be in league with the demons. It’s a familiar trope, the wicked stepmother, but in Arden’s hands, the story is so much more. The novel spans from Vasilisa’s birth until she is a young woman, her path continually crossing with the pre-Christian world of old gods and magic. The story is beautifully told, full of fragments of familiar fairy tales and legends told anew. The characters are fully drawn – from Vasya’s fierce love for her family and desire to be independent, to Anna’s faith-based torment and fearfulness – the core of who they are moves the plot and makes even the “villains” sympathetic. Against a backdrop of magic and the harshness of Rus’ in winter, Arden delivers a story that feels epic, providing real growth for each character. The relationships are where the novel shines the brightest, and the magic and fairy tale elements surround like a delicate setting holding a beautiful jewel. The Bear and the Nightingale is a gorgeous book, a wonderful starting place for Arden’s work, and I look forward to the sequel, The Girl in the Tower, coming out at the end of the year. Betty Rocksteady is an author and an illustrator. 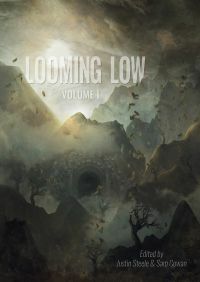 My recommended starting place for her work is Dusk Urchin from the recently-released anthology Looming Low. Ashley is alone in her house when someone knocks at her door. She answers, despite her better instincts, and discovers her elderly neighbor, Mr. Peterson, accompanied by a child she’s never seen before. She assumes the child must be his granddaughter, but there’s something off about the whole situation. Her neighbor seems disoriented, and the girl is utterly silent. The neighbor asks for help. He claims the girl is his daughter, and at the same time he claims he doesn’t know her. He tells Ashley he killed the girl and buried her in his yard, yet she’s right there at his side. When she can’t get a straight answer, and doesn’t know how to help, Ashley guiltily sends her neighbor away. Then the silent girl shows up at Ashley’s door, calling her mommy. Did she have a daughter? She must have a daughter. Her daughter was talking to her. Her daughter couldn’t be talking to her if she didn’t have a daughter. The knob of the closet was cold. She shouldn’t open it. She had to open it. Rocksteady starts with a vague sense of unease and something wrong, and builds the tension to leave the reader with a sense of dread. There’s something truly terrifying about the idea of supernatural enemy that will not stop and cannot be reasoned with. There is no safe place, nowhere to hide; the little girl reaches Ashley even inside her own mind. The brevity of the story allows the reader to bring their own interpretation to the situation, delivering a perfect, bite-sized bit of horror that gets under your skin, making it an effective place to start with Rocksteady’s work. 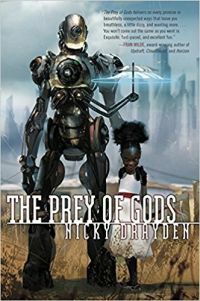 Nicky Drayden is a prolific short fiction author, but my recommending starting place is her debut novel, The Prey of Gods. The story is set in and around Port Elizabeth in the near(ish) future where animals such as rhinos and elephants are extinct, but genetically engineered replacement and hybrid creatures are common, and nearly everyone has a personal bot called an alphie. Through the alternating viewpoints of a teen named Muzikayise (aka Muzi), a councilman named Stoker, a pop singer named Riya Natrajan, a demi-goddess named Sydney, a young girl named Nomvula, and Clever 4.1, a bot in the process of gaining sentience, Drayden weaves a story about emergence, personal growth, and evolution. A designer drug is unleashed onto the market that not only causes hallucinations, but taps into the latent divinity of human beings. Meanwhile, Nomvula – a young girl whose mother was raped by a powerful demi-god – is accused by her mother of witchcraft when she befriends the demi-god and tries to learn about her own powers from him. As Nomvula tries to protect herself from the angry mob her mother calls down on her, she accidentally taps into her power and obliterates her village, drawing the attention of another powerful and ancient being. Sydney, a harpy-like creature, whisks Nomvula away, determined to use her for her own ends. Muzi is about to undergo the circumcision ritual that will make him a man. On the day of the ceremony, his best friend, Elkin introduces him to the new drug called godsend, which gives Muzi the power to control minds at the expense of reliving his targets’ worst memories. Councilman Stoker’s mother is determined to see him run for Premier, meanwhile Stoker’s heart is with his secret life as Felicity Lyons, a singer/dancer preparing to audition to be the opening act for superstar Riya Natrajan. The characters’ stories inevitably collide and intertwine as the world itself teeters on the cusp of change. Humans are experiencing emergent godhood, while bots are gaining sentience. The theme of evolution and growth plays out on a smaller scale as well, as Stoker becomes Felicity, Muzi and Nomvula struggle with their powers, and Riya tries become a kinder human being. Drayden offers up complicated characters, each on their own journey, with their own baggage and their own strengths. Prey of the Gods contains a wealth of complicated relationships – between Muzi and his grandfather, between Muzi and Elkin, between Nomvula and Sydney, and between humans and bots, to name a few. There’s plenty of action, and touches of humor as well. Drayden packs a lot into the novel, balancing it all perfectly, leaving no character’s growth or journey short-changed, while making the future setting feel real and fully lived in. It’s an excellent novel, and an excellent place to start with Drayden’s work. Jewelle Gomez is a writer and activist. 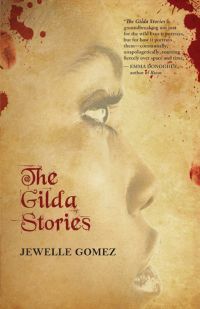 My recommended starting place for her work is her Lambda Award-winning novel, The Gilda Stories. The novel returns to the roots of vampire fiction and one of the earliest works of vampire fiction, Sheridan LeFanu’s Carmilla, with a story focusing on women and women’s sexuality. At the same time, The Gilda Stories goes so much deeper, refuting Carmilla and even Dracula with its idea of female sexuality, and sexuality in general, as a dangerous thing. As a runaway slave in Louisiana in 1850, the Girl is rescued by a white woman named Gilda and her lover, a Lakota woman named Bird. They take her in and care for her, eventually revealing their true nature as vampires and bringing her into their family. Unlike the traditional idea of vampires as predatory monsters, Bird and Gilda teach the Girl their way of taking blood, which is built on love, and always giving something in return. They only consume what they need to survive and always leave something in return – fulfilling dreams, inspiration, a sense of well-being. Some are said to live through the energy of fear. That is their sustenance more than sharing. The truth is we hunger for connection to life, but it needn’t be through horror or destruction. Those are just the easiest links to evoke. Once learned, this lesson mustn’t be forgotten. To ignore it, to wallow in death as the white man has done, can only bring bitterness. Soon after welcoming her into their family, Gilda chooses to end her life, giving the Girl her name. Bird continues to care for the newly-named Gilda, teaching her multiple languages and how to survive. Eventually, Bird leaves Gilda, needing to reconnect with her roots and shed her bitterness over the first Gilda’s death. The story picks up again in Yerba Buena in 1890. Gilda is with Sorel, the man who welcomed the first Gilda into her new life as a vampire. Gilda learns from Sorel and his lover Anthony, but also befriends Eleanor another vampire created by Sorel. This is the first of many female friendships Gilda builds over the years, but it is tinged with lust, and ultimately violence. In Missouri in 1921, Gilda befriends Aurelia, a widow. Older and wiser now, Gilda helps Aurelia become her own person, gain confidence, and start school for the poor. In Boston in 1955, Gilda works as a beautician, and helps save a young woman named Toya from her abusive pimp. The novel continues through the year 2050. Gilds works in a theater. She is a romance novelist. She is on the run at a time when humanity is collapsing in on itself, resources are scarce, and vampires are hunted for the promise of eternal life. In each time period, while Gilda has a core family in Sorel, Anthony, and Bird, her life intersects with humans. Just as it is with the blood, there is give and take; she learns from them as they learn from her. Each relationship is different – Gilda relates to those around her as a friend, a sister, a mother, a lover. When she turns to violence, it is as a last resort. For the most part, Gilda’s relationship is about seeing those around her truly, and giving them what they most need to flourish. In the stories that make up Gilda’s life, we witness women making space for themselves and each other in a world dominated by men, black people making space for themselves in a world controlled by white people, and queer people, making space for themselves in a hetero-normative world. Gilda chooses and builds her family, and ultimately weaves that family together into a larger community, making the novel a stunning contrast to most vampire fiction which is often about loneliness, rivalry, violence, and suffering. It’s a beautiful novel, and a wonderful starting place for Gomez’s work. Last, but not least, my recommended starting point for the work of Jennifer R. Donohue is Aground, Upon the Sand, a flash piece that tells a story of loss, longing, and being a stranger in a new land. The unnamed protagonist is a selkie. Her skin is gone, and she doesn’t speak about why. She can’t go home, and only one sister comes to visit her on the beach, the one place in-between worlds where they can meet. Here, the protagonist shares things from her new life, soft boots that remind her of walking on water and pumpkin spice lattes. On the surface, it is a story about selkies, but it can just s easily be read as an allegory for the experience many immigrants have, finding themselves alone in a new culture, trying to adjust and make new friends while aching for home. Candy corn, one of my favorite things, some sweetness in the salt of her life. A trio of leaves: red, orange, and yellow. My work apron, grease-smelling even after repeated washings. A calendar, because time is days and weeks and months here, not the change of the currents and the movement of the birds, the tidal instinct in our bellies that’s impossible to describe and unnecessary to understand. Donohue balances the selkie’s sadness and loss with a sense wonder, allowing her to take joy in small things like blue nail polish and shared music. It is a bittersweet story, full of gorgeous descriptions and poignant moments, making it an excellent starting place for Donohue’s work. So there you have November’s reading recommendations. Stay cozy as the weather turns, and as always, I’d love to see your own recommendations for women to read in the comments!